Choosing the right replacement faucet for your kitchen can sometimes be quite confusing when faced with a multitude of styles and features. One of the easiest ways to get tripped up is to purchase a retro-looking fixture only to discover later that it isn't compatible with your older plumbing. However, any lingering confusion you might have will quickly vanish once you understand the different types of kitchen faucets currently on the market, and how each could serve your needs. 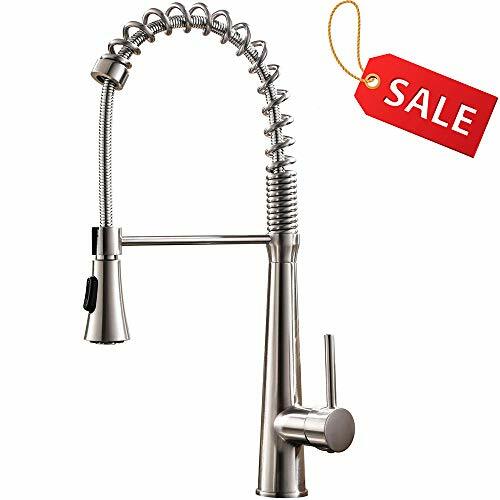 There are four main types of kitchen faucets commercially available, three of which are considered washerless (cartridge, ball, and disc) with the remaining one being the old-style compression type that still uses washers. 1. Cartridge: This faucet uses a sealed, moving cylinder that moves up and down to regulate water flow. Although the single handle feature is similar in appearance to the ball-type, the difference is the handle only moves back to turn on, with a left and right movement to adjust water temperature. The double handled variety looks almost exactly like a standard compression model, but the separate knobs require no additional pressure to close the tap. 2. Ball: This was one of the first of the washerless types on the market. It features a single handle that moves a slotted ball valve that you push back and forth to turn on and off. The side to side movement controls both the water flow rate and temperature. These faucets are slightly more complicated than the others and have a number of small parts like o-rings and springs that can wear out and leak over time. 3. Disc: Ceramic disc faucets are the most recent development in fixtures and by far the most reliable. They are controlled simply by raising the lever on a single-handle model and turning the individual knobs on a double-handle type. The proper mixing of hot and cold water is done inside a cartridge specifically designed for this purpose. This cartridge rarely needs any servicing or repair, and some even come with lifetime guarantees. This faucet tends to be rather expensive and should be regarded as a precision instrument, so before you invest in one, be sure your water source is filtered, and be careful not to be too forceful with the controls. 4. Compression: These are found in mostly older homes, and are the least expensive, most leaky faucets. They are instantly recognizable by the amount of pressure it takes to open and close the separate hot and cold knobs. They use neoprene rubber washers as seals, which tend to wear out more quickly than other types of faucet seals. These seals are very easy to replace, but some of the really older washers are no longer available. Since these faucets often need frequent maintenance, a good understanding of how they work is helpful. Before you commit to replacing the original faucet in your kitchen, check under the sink first to see how many pre-drilled holes it has. There may be a base plate on top that is covering up holes that could be used to mount models different than yours. If there is just one hole, your options are limited, although there may be more remote openings for a sprayer hose or soap dispenser. What type of accessories/extra parts will the job entail? Is the spout design appropriate for my needs, and will the design match my kitchen decor? Once you've covered all these bases, it's time to go shopping!